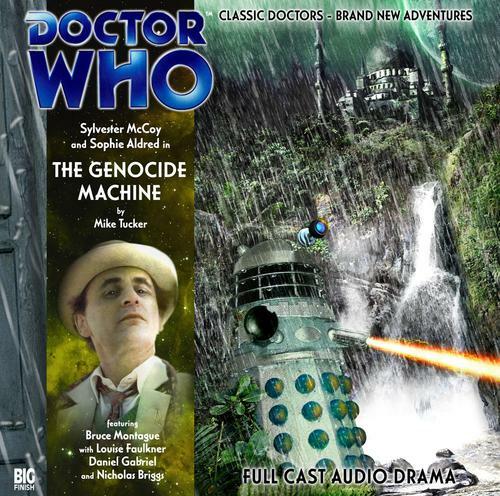 Sylvester McCoy is the Doctor in The Genocide Machine. To no one’s surprise, the Daleks were the first villains from the television series to be introduced into the Big Finish line of audios. Their debut should have been a grand moment, but sadly, The Genocide Machine suffers from a mish-mash of ideas that don’t quite gel together, a weak supporting cast, and some horrible, horrible dialogue that drags the whole thing down, even as the Daleks do their best, for once, to save things. The library on the jungle planet of Kar-Charrat holds every piece of information in the universe. Their librarians are always scouring the cosmos for every scrap of data they can find, constantly working to update their stores and maintain their accuracy. When Ace finds some overdue books in the TARDIS, the Doctor decides a visit to the library is an excellent idea. Of course, very few people KNOW Kar-Charrat exists, as it’s hidden behind a temporal shield for its protection. After all, all the information in the known universe could be a very powerful weapon in the wrong hands. Nearby, Bev Tarrant (who also appears in the previously-reviewed-but-later-in-canon serial Dust Breeding) and her salvage team study an ancient ziggurat. The structure, however, holds a Dalek, one who has been waiting in hibernation for centuries for a Time Lord to show up, as only a time-sensitive being could penetrate the library’s defenses and allow the Daleks to seize their prize – the Wetworks Facility, the library’s answer to the Matrix of Gallifrey; storage tanks where every scrap of information is embedded upon the very molecules of water. Let’s start with the Daleks. They are easily the high point of The Genocide Machine. If you were a long-time fan of Doctor Who and had a chance to both write AND play a Dalek in a serial, you’d be as giddy as a clam. 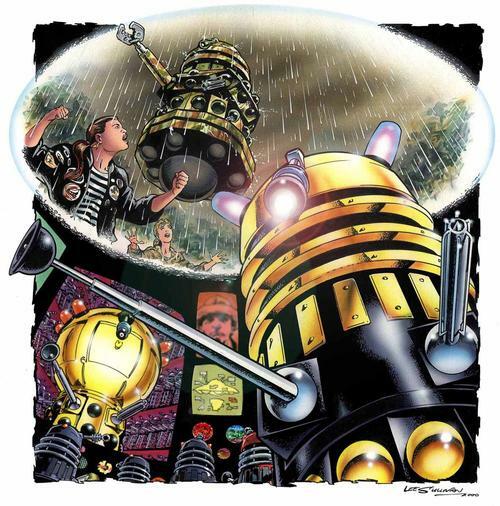 Nicholas Briggs and Alistair Lock absolutely shine as the voices of the Daleks. With the aid of altered voices, the pair nail the Daleks, in terms of volume (there’s a reason Daleks scream), in terms of superiority (in ordering both prisoners AND subordinate Daleks about) and in terms of chaos (the massacre of the library’s staff is very harrowing to hear, laser fire, human screams, and Dalek screams). There are a few moments when a Dalek goes absolutely insane due to all the information in its head, and hearing it scream as it opens fires on everything and everyone is amazing. It’s a scene that might have come off a little cheesy had it been on television, but in audio form, the insane Dalek is a thing of horrible beauty. Briggs and Lock really deserve credit for not only portraying the Daleks in the manner they do, but also coming up with a plan that would have been right at home among the television Daleks; the long game, waiting for a Time Lord to show up as they always do so they can engage in their “unstoppable” plan to control the universe. I also have to give credit to the other alien race in this story. Without giving anything away, the Wetworks Facility isn’t as neat and clean as it appears, and when the truth about it comes out, the Doctor gets absolutely livid, and McCoy plays a ranting, livid Doctor with the best of them. The way they dispatch the Daleks is also very well done, and very unique. It’s a neat concept for an alien race, showcasing Briggs’ imagination and talent for writing. But it’s all downhill from there, sadly. After a rousing turn in The Fearmonger, Sylvester McCoy and Sophie Aldred sound almost bored during their performances. I can’t blame Ms. Aldred, as some of Ace’s dialogue is absolutely cringe-worthy, very “Ace-speak” as if Ms. Aldred was still in the late 80’s. Where Ace in The Fearmonger showed signs of maturity and a spine of steel, here Ace is pouty, whiny, and complains often. I had to say to myself “is this Ace, or Tegan” a time or two. Her performances in Dust Breeding and Colditz are much, much better, and her characterization evens out as the Big Finish line unfolds, but for now, coming from The Fearmonger, it’s a bit of a shock. McCoy sounds a little better, especially during the second half of the serial when he realizes what the Wetworks facility is and how to beat the Daleks. But the first half is dreadful. The Doctor doesn’t show the confidence that he did in The Fearmonger, the dialogue feels rushed and a little garbled, and it just feels like McCoy was phoning this one in. The script itself, really, is the biggest problem. Dialogue aside, there are a LOT of ideas being thrown about, and while some of them are neat (the Daleks playing a long game, the native race to the planet making an appearance), this is the biggest concern of mine…what’s the point of having a library if no one goes to it? For a massive, huge, important library, there are no other patrons than the Doctor, and the only time we hear any other staff is when they’re being exterminated by the Daleks. A library with all the knowledge of the universe is a neat idea, but it just doesn’t play right on this audio, and leaves…not quite a plot hole, but a setting hole. It’s a crying shame, as the Daleks deserve better (and so do McCoy and Aldred! ), but luckily the next Dalek serial is an improvement upon this one. Next up – When the planet Archetryx is threatened by a Dalek assault squad, the Doctor and Evelyn become embroiled in an ever-deepening mystery. What has become of President Romana, missing for twenty years? Colin Baker is the Doctor in…The Apocalypse Element. This entry was posted in Big Finish Review and tagged Ace, Big Finish, Daleks, Doctor Who, Seventh Doctor, Sylvester McCoy, TARDIS. Bookmark the permalink.